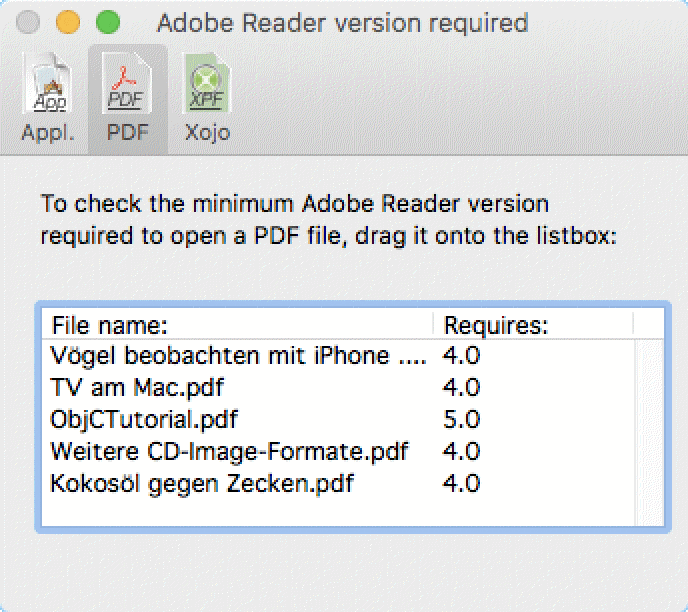 If you want to check what minimum operating system version is requirered to run an Application, or which Acrobat Reader version is at least required to open a PDF file, you may want to run this tiny application. Hint: If you've set up a RAM Disk, go to the app's Preferences window and set GetMinVersion to copy the file in request to RAM Disk first. It'll be opened from there then. This works for documents only, but not for Apps. Applications will be checked from within the Applications folder directly. "GetMinVersion" may be included at any download sites, with no permission required.